It’s Earth Day once again, a time for celebration and planning for how best to preserve our planet for next year and the next generation. This year we have some great news: Annual global emissions of CO2 gasses have, for the first time in 40 years, remained the same as the previous year. This shows that measures which work are starting to be adopted across the globe. All of the energy-star rated light bulbs, renewable energy plants, recycling centers, and conservation efforts put into place over this past generation are bringing a visible effect to the world. Next Wednesday (April 22nd) marks the 45th Annual Earth Day celebration and, in honor of this fantastic milestone and the people who will gather in Washington on Saturday, we’d like to highlight some simple ways you can help when it comes to the global climate and health of the Earth. The UN declared 2015 the International Year of Light, as part of a project to bring safe and energy-efficient lighting to under-developed parts of the world. Many of these places are currently using kerosene lamps because they are not on an existing electrical grid. Because of this, solar and alternative energy lamps are being improved and installed, helping us globally with better energy-efficient lighting. At home, you can already take similar steps. 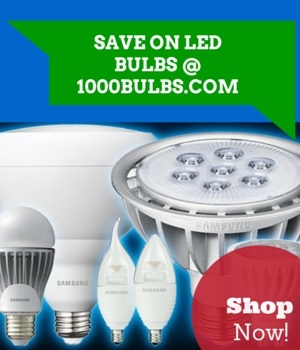 Energy efficient lighting is the simplest and easiest step you can take. CFLs and LEDs not only use less energy per lumen, but they produce less heat. The lower heat output means you spend less energy on cooling during the summer months. As we lower our energy consumption, we burn less fuel overall, saving resources and lowering CO2 emissions. Of course, running your central heating and air less, or upgrading to a smart thermostat to more accurately control your home environment, will have a similar effect. Don’t forget that these small changes can save you quite a bit on your electricity bill, so everyone is helped. There’s a wealth of information out there on growing your own food and reducing dependence on commercial agriculture. Hydroponic systems use less water than traditional gardening (by generating less waste-water and run-off), and can benefit from similar organic techniques such as composting. Growing indoors has the added benefit of protecting your plants from many of the typical pests and fungi that would typically require some form of organic or non-organic pesticide or fungicide. Drip irrigation and a recirculated water system for hydroponics provide not just a method of using less water, but let you control where and how that water (which is likely no longer pH neutral) is released. I know heat is a hot topic in this post, but if you’re worried about how much energy you’ll spend on lamps and cooling for a simple indoor-garden, don’t forget that there are both fluorescent and LED grow lamps available. They cost a little more, but they use far less energy and don’t run anywhere near as hot as traditional HID lamps. It would be an extreme oversight to neglect mentioning recycling in any article on inexpensive ways to reduce global emissions. So, while we’ve covered how to recycle light bulbs before, it’s important to remember that everything you can recycle helps in the long run. While we typically think of metals, plastics, and papers when we discuss recycling, it’s important to remember that electronics and batteries typically bear the “do not throw away” symbol. Batteries are all too often thrown into the trash, where they slowly leak heavy metal elements into the environment. Some of the more common items that should always be taken to a recycling center (as opposed to being placed with the standard recycling or trash pickups) are aerosol sprays and pesticides like bug-bombs. The latter don’t just contain hazardous chemicals, but their delivery methods pose a risk if their containers are punctured, crushed, or incinerated. Always recycle these things, not just for the planet, but for the sake of your city’s sanitation workers as well. Happy Earth Day everyone! Let’s see what we can do together to make this world and its people live long and prosper. Don’t forget that National Arbor day is in two days this year, so why not plant a tree while you’re at it? Let us know how you plan to celebrate, or what you plan to do this year by commenting below or telling us through Facebook, Twitter, Google Plus, LinkedIn, Pinterest, or Instagram!